BCS provides bench top ultrasonic models with capacities from 1.5 gallons to 6.8 gallons. 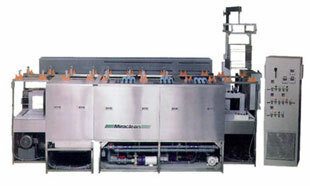 Single tank floor standing models or multiple tanks in ultrasonic “benches” which may include ultrasonic rinses with or without heat, hot air blow off or full drying capability with manual or programmable hoists moving baskets of parts to preprogrammed stations in the line. Bag, cartridge, ion exchange or ultra filtration can provide exceptionally clean bath solutions and de-ionized water rinses as required. 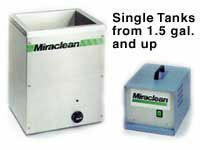 Not every part can be cleaned and dried adequately with aqueous soap solutions. Accordingly BCS provides a full range of EPA permitable Vapor Degreasers from single tanks to multiple stations with programmable hoists, with or without ultrasonics. See Dryer section at the end of Vibratory section of this web site. See our blast section of this web site for more information on this process and equipment. Dry Ice pellets approximately the size of a grain of rice are fed into a compressed air stream much like pressure abrasive blasting. Large parts such as plastic and slush molds are cleaned in place on the molding equipment where no damage or substrate removal can be permitted. Sharp ends of the CO2 pellets knock off tenacious soils from the substrate and then sublimate off into the atmosphere as a harmless gas.